When a black hole tears a star apart, the star's material is stretched out into what's known as a tidal stream. 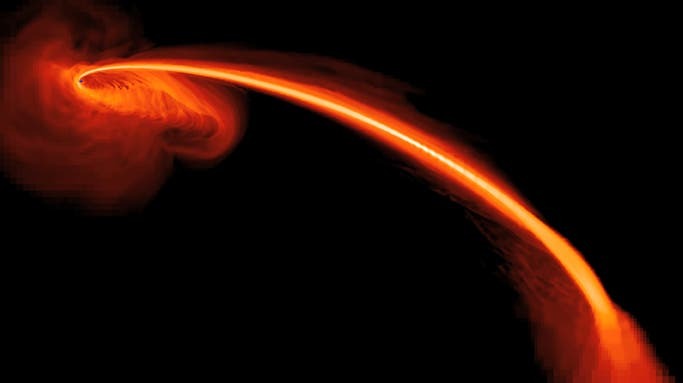 That stream continues on a trajectory around the black hole, with roughly half the material eventually falling back on the black hole, whipping around it in a series of orbits. Where those orbits intersect each other, the material smashes together and circularizes, forming a disk that then accretes onto the black hole. Astronomers don't observe anything until after the tidal streams collide and the material begins to accrete onto the black hole. At that point, they observe a sudden peak in luminosity, which then gradually decreases as the tail end of what's left of the star accretes and the black hole's food source eventually runs out. "It is an effect of general relativity that is modulating the digestion process of the black hole, so the digestion rate depends strongly on the mass of the black hole," Ramirez-Ruiz said. The researchers ran a series of simulations of tidal disruption events around black holes of varying masses and spins to see what form the resulting tidal streams take over time. They found that precession of the tidal stream due to the black hole's gravitational effects changes how the stream interacts with itself, and therefore what astronomers observe. Some cases behave as expected for what's currently considered a "typical" event, but some do not. Furthermore, for cases where the black hole is both massive and has a spin greater than a certain value (about 20 percent of its maximum allowed spin), the tidal stream doesn't collide with itself right away. Instead, it can take many windings around the black hole before the first intersection. In these cases, it may potentially be years after a star gets ripped apart before the material accretes and astronomers are able to observe the event.